Who should not take Enskyce? What conditions does Enskyce treat? Tell your doctor right away if you have any serious side effects, including: lumps in the breast, mental/mood changes (such as new/worsening depression), severe stomach/abdominal pain, unusual changes in vaginal bleeding (such as continuous spotting, sudden heavy bleeding, missed periods), dark urine, yellowing eyes/skin. This medication may rarely cause serious (sometimes fatal) problems from blood clots (such as deep vein thrombosis, heart attack, pulmonary embolism, stroke). Get medical help right away if any of these side effects occur: chest/jaw/left arm pain, confusion, sudden dizziness/fainting, pain/swelling/warmth in the groin/calf, slurred speech, sudden shortness of breath/rapid breathing, unusual headaches (including headaches with vision changes/lack of coordination, worsening of migraines, sudden/very severe headaches), unusual sweating, weakness on one side of the body, vision problems/changes (such as double vision, partial/complete blindness). List Enskyce side effects by likelihood and severity. Before using this medication, tell your doctor or pharmacist your medical history, especially of: blood clots (for example, in the legs, eyes, lungs), blood clotting disorders (such as protein C or protein S deficiency), high blood pressure, abnormal breast exam, cancer (especially endometrial or breast cancer), high cholesterol or triglyceride (blood fat) levels, depression, diabetes, family or personal history of a certain swelling disorder (angioedema), gallbladder problems, severe headaches/migraines, heart problems (such as heart valve disease, irregular heartbeat, previous heart attack), history of yellowing eyes/skin (jaundice) during pregnancy or while using hormonal birth control (such as pills, patch), kidney disease, liver disease (including tumors), stroke, swelling (edema), thyroid problems, unexplained vaginal bleeding. What should I know regarding pregnancy, nursing and administering Enskyce to children or the elderly? 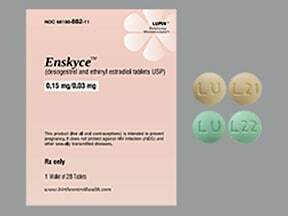 Does Enskyce interact with other medications? Should I avoid certain foods while taking Enskyce? Do not flush medications down the toilet or pour them into a drain unless instructed to do so. Properly discard this product when it is expired or no longer needed. Consult your pharmacist or local waste disposal company.Information last revised July 2018. Copyright(c) 2018 First Databank, Inc. 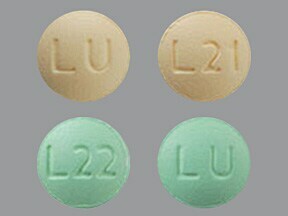 This medicine is a multi-color (2), round, film-coated, tablet imprinted with "LU" and "L21 or L22". Are you considering switching to Enskyce? How long have you been taking Enskyce?